As November Approaches, Courts Deal Series Of Blows To Voter ID Laws : The Two-Way In the past two weeks, judges have ruled against voter ID or proof-of-citizenship requirements in Texas, Kansas, North Carolina, Wisconsin and North Dakota. 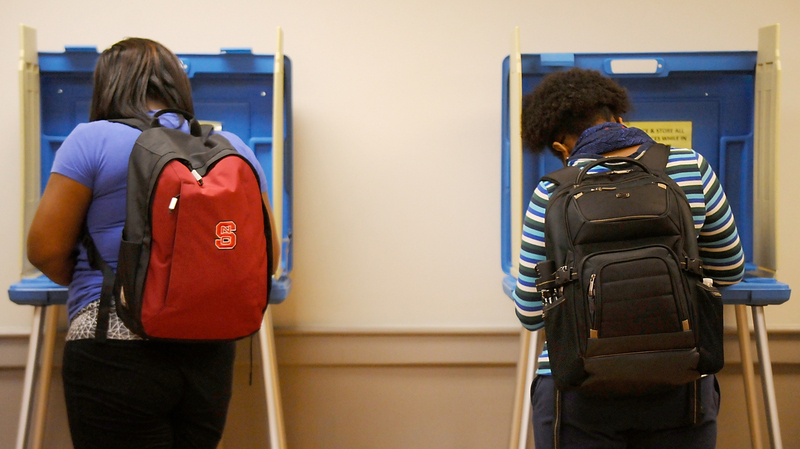 North Carolina State University students vote in the primaries at Pullen Community Center on March 15 in Raleigh, N.C.
"It's been like Christmas Day," one activist told CNN on Monday. A federal judge in North Dakota went further: "The undisputed evidence before the Court reveals that voter fraud in North Dakota has been virtually non-existent," he wrote, as he rejected a voter ID law justified by fears of such fraud. On July 20, a federal appeals court ruled that Texas' voter ID law had a discriminatory impact on voters, and ordered a lower court to come up with a fix before elections in November. It's "probably the strictest voter identification law in the country," as NPR's Pam Fessler puts it, and activists say it disproportionately impacts black and Hispanic voters. "A district court had found not only that the law discriminated, but that it was intentionally designed to do so. The 5th U.S. Circuit Court of Appeals saw some flaws in that conclusion and instructed the lower court to reconsider that element of the case and rule again — preferably after Election Day." So this case — which has been ricocheting through the court system for years now — is far from over. On July 29, a three-judge panel of the 4th U.S. Circuit Court of Appeals overturned North Carolina's sweeping voter ID law (which included a host of other voting restrictions, including shortening the early voting period and banning same-day registration). And — unlike in Texas — the appeals court ruled that North Carolina legislators had actually passed the law with discriminatory intent. As the Two-Way reported then, "The appeals court noted that the North Carolina Legislature 'requested data on the use, by race, of a number of voting practices' — then, data in hand, 'enacted legislation that restricted voting and registration in five different ways, all of which disproportionately affected African Americans.' "
The court wrote that the changes to the voting process "target African Americans with almost surgical precision," and "impose cures for problems that did not exist." "Wisconsin's ID law has been the subject of litigation ever since it was passed by the state's Republican-controlled Legislature in 2011. Proponents said the law was needed to prevent voter fraud, although there has been little evidence of voter impersonation at the polls," NPR's Pam Fessler reported in 2015. The Supreme Court declined to get involved, and voters had to show ID in this year's primaries. Wisconsin's strict version of voter ID law is a cure worse than the disease. But on Friday, a U.S. district judge struck down several parts of the state's strict voter ID law — as well as other election laws passed by Republican state lawmakers, the Milwaukee Journal Sentinel reports. Among the provisions he overturned: limits on early voting, a requirement that people must live in a ward for 28 days before voting, a prohibition on expired student IDs and a ban on emailing absentee ballots to voters. The judge also required that anyone with difficulty getting an ID must be granted a voting ID within 30 days, the Journal Sentinel reports. "The evidence in this case casts doubt on the notion that voter ID laws foster integrity and confidence. The Wisconsin experience demonstrates that a preoccupation with mostly phantom election fraud leads to real incidents of disenfranchisement, which undermine rather than enhance confidence in elections, particularly in minority communities. To put it bluntly, Wisconsin's strict version of voter ID law is a cure worse than the disease." On Friday, a judge ruled that Kansas citizens must be allowed to vote in state and local elections, even if they didn't show proof of citizenship when they registered. "Since 2013, Kansas has required residents to show proof-of-citizenship when they register to vote. But a number of courts have blocked that requirement when it comes to federal elections — for president or members of Congress. "In response, the state set up a two-tiered system where those who don't show proof-of-citizenship can vote in federal elections, but not state or local ones. But that arrangement was struck down earlier this year by a state judge, for those who used a national voter registration form. "Still following? There's more. In May, a federal judge ordered the state to start registering approximately 18,000 voters whose registrations had been held in suspension because they didn't show proof of citizenship. Kansas Secretary of State Kris Kobach has appealed. He argues that the law is needed to stop immigrants in the country illegally from voting ... Kobach has ordered that the suspended voters be registered, but only for federal races." On Friday, just days before the primaries in Kansas' state elections, a county judge overturned Kobach's order. In his oral ruling, he said votes from people who didn't show proof-of-citizenship must be counted — even in local and state elections. If the same policy holds in November's elections, 50,000 people could be affected, the Wichita Eagle reports. On Monday, a federal judge blocked a law requiring photo ID to vote in North Dakota, ruling that the law unfairly burdens Native Americans in the state. As The Associated Press reports, North Dakota doesn't require voters to register, but starting in 2004 it has required identity cards. There was an exception allowing people without an ID to vote, as long as a poll worker could sign an affidavit vouching for them — but in 2013, the exception was overturned. "The public interest in protecting the most cherished right to vote for thousands of Native Americans who currently lack a qualifying ID and cannot obtain one, outweighs the purported interest and arguments of the State," U.S. District Judge Daniel Hovland wrote. "No eligible voter, regardless of their station in life, should be denied the opportunity to vote." No eligible voter, regardless of their station in life, should be denied the opportunity to vote. Almost a quarter of Native Americans in the state, otherwise eligible to vote, don't have proper ID; that's only true for 12 percent of non-Indians, the AP reports. Voter ID laws aren't the only voting-rights cases that have landed in the courts this summer. Earlier in July, the Virginia Supreme Court ruled that Gov. Terry McAuliffe didn't have the authority to restore voting rights to hundreds of thousands of felons at once; McAuliffe has pledged to restore those rights individually. In Ohio, judges ruled earlier this summer that the state couldn't eliminate a week of early voting or change laws governing how absentee and provisional ballots are counted. Those cases are currently being appealed. The spate of high-profile voting-rights cases isn't just a coincidence. For several of these cases, the current legal battles can be traced back to one Supreme Court decision. In 2013, the Supreme Court struck down a key provision of the 1965 Voting Rights Act. The act said the federal government had to approve any changes to the voting process in certain states — ones with a history of discrimination. In Shelby County v. Holder, the Supreme Court said the formula used to determine which states qualify was outdated, and the requirement couldn't be enforced until Congress comes up with a new standard. Since then, a "blizzard" of changes have been carried out by state and local authorities, as the New York Times reported over the weekend. And more conspicuously, states that would have needed pre-approval — including Texas and North Carolina — passed voter ID laws after that decision, as Frontline has reported. One result: More voting-rights lawsuits than usual. "We have to go out and sue rather than blocking bad laws before they go into effect," the head of the voting rights unit of the Justice Department told NPR's Carrie Johnson this spring. "And that's been a big change for us."